There’s a new session in town. 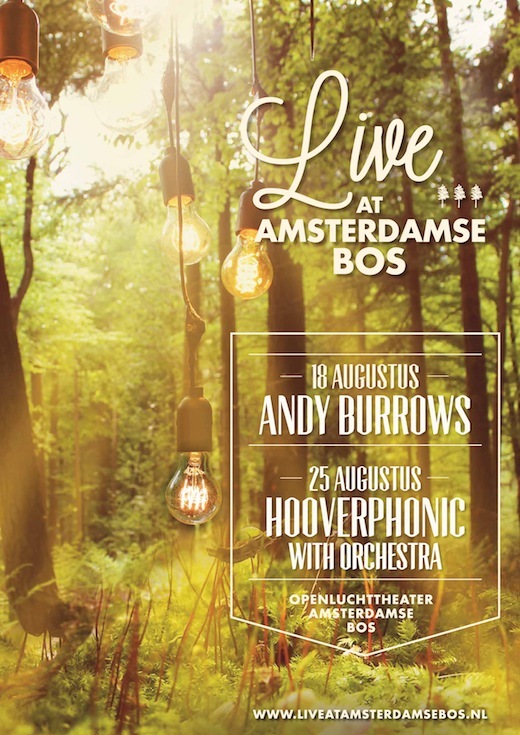 Live at Amsterdamse Bos is a series of intimate open air concerts on Sundays in the park. Take a walk, have some drinks, enjoy a picnic and dream away to the music of several bands and singer-songwriters. Last Sunday the event kicked off, starring British singer-songwriter Andy Burrows. Before he went solo –his album Company came out last year– he was the drummer of pop band Razorlight. The concert at the Amsterdamse Bos was a huge success. So why would I tell you about something that’s already happened? Because it’s not too late for you to enjoy a musically fulfilling day at the park! Next week the Belgian pop band Hooverphonic will perform with an entire orchestra. Hooverphonic is a band from the nineties, you might know them from their hit song Mad About You. They’ll take you away into a little dream world within the woods with their romantic, vivacious music. Ideal for a lazy Sunday concert.